The Nazaret Apartments are the ideal place to stay as a family during your vacation. 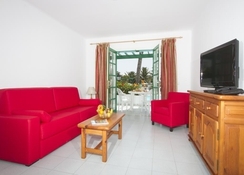 The apartments are complete with private terraces made in typical Canarian style. They enjoy close proximity to the Las Cucharas Beach (about 500 metres) and are about 9km from Arrecife – the capital city of Lanzarote. The apartments feature a private outdoor terrace with furniture, while the lounge area has sofas and television. They also come fitted with en suite bathrooms with a bathtub and hairdryer. Modern kitchenettes with all the necessary utensils and microwave are another feature of the apartments. In the common areas there is a restaurant that offers breakfast and dinner buffet style. There’s also a bar and lounge in the pool area allowing you to enjoy alcoholic & non-alcoholic beverages, and fresh juices. While you are here, don’t forget to check out the hotel’s pétanque court. 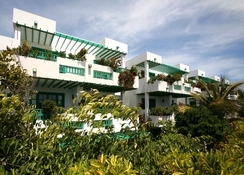 The Nazaret Apartments are situated on the the island of Lanzarote. 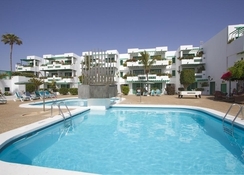 The apartments are only a mere 500 metres from Playa de las Cucharas, and about 4.5km from the Costa Teguise Golf Club. 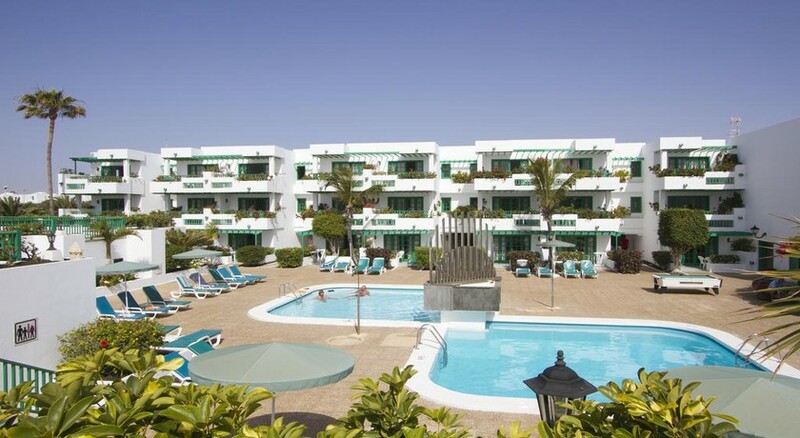 The apartments enjoy being close to several shopping centres and the Costa Teguise Aquapark is only 2km! 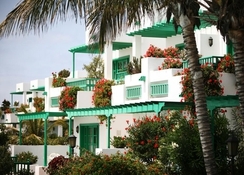 The island’s capital – Arrecife is only 9km, while the Lanzarote Airport is about 15km from the property. As the name of the hotel suggests, Nazaret Apartments offer one-room apartments, one-room apartment with a king size bed and two-room apartments. All apartments feature a living area with sofas and television, which opens onto a large private terrace with outdoor furniture. The bathrooms come with a bathtub and hairdryer. They also come with a fully equipped kitchen along with a safe and free Wi-Fi. The accommodation at Nazaret Apartments feature a fully equipped kitchen and guests usually cook the food of their choice. However, there are a several bars & restaurants close to the hotel. Visit the Beijing Chinese restaurant or taste local cuisine at Grill La Vaca Loca. Enjoy evenings of house wines, beers and cocktails accompanied by music at the Plaza Bar and Cafe or the Mai Tai Pool Bar and Restaurant. 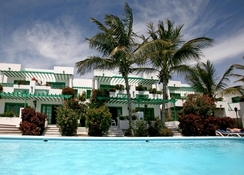 The Nazareth Apartments enjoy close proximity to the beach. 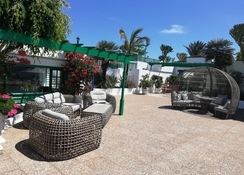 The property features an outdoor pool with sun loungers and a petanque court. The reception is open from 8am – 10pm offering tourist information along with a car rental service. Enjoy a cool refreshing dip at the outdoor swimming pool or head out to the beach Playa Las Cucharas for a day of sunbathing. One of the swimming pools is heated during the winter season only.